It's perplexing to think that Gary Numan supposedly didn't appreciate The Pleasure Principle for years. While it wasn't exactly the first of its kind, it's definitely in the conversation for catalysts of the synth-pop explosion in the early 1980s. Luckily, he's come to his (and everyone else's) senses by warming up to the album and playing it live in its entirety to celebrate its 30th anniversary. Its songs were originally written for guitar with the Tubeway Army before Numan's fascination with synthesizers took over. And to look at the stage at Metro on Tuesday, that fascination is still alive and well. Four synth setups were accompanied by drums and bass guitar. Although the drums were ridiculously high in the mix (and Numan's vocals were often low from where I stood), there was no question that the synths were running the show. Even though the draw was to hear The Pleasure Principle, oddly enough the album was not played sequentially. The order wasn't changed drastically, but closer "Engineers" was early, a couple tracks were switched and "Random" (not even on the album, but from its sessions) opened the set. However, the songs were not altered greatly from the recorded versions that those in attendance have heard hundreds of times. Arrangements were pretty faithful. It was a little more raw, but that's to be expected live. Even with Numan perpetuating the idea of electronic artists as robots arguably more than anyone else not in Kraftwerk, he is far from an android on stage where from behind a keyboard he's lively and dramatic. Once The Pleasure Principle was complete, the set turned to scattered hits ("Down in the Park", "Are 'Friends' Electric? ", "I Die: You Die") in a sea of recent material from the 2000s' Pure and Jagged. All the while, it was hard not to hear it as Gary Numan being influenced by those who came up practically fawning over his music. From his new wave and synth-pop roots, he's progressed much more into industrial-like sounds that some of his followers honed. 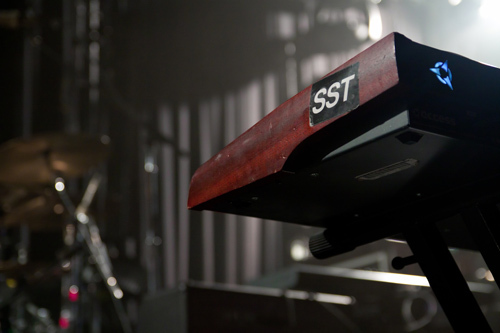 A Nine Inch Nails connection was easy to make on many songs and the show was packed with hooks that've been sampled in hip hop and by Basement Jaxx and Sugababes. It's been a long road and he's had some tough times, but there's a good reason why Metro was full. 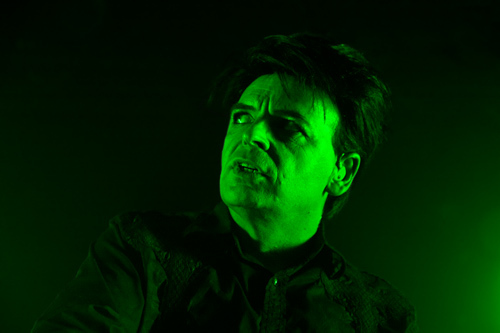 Numan has an arsenal of top-notch songs and he's stayed an energetic performer.